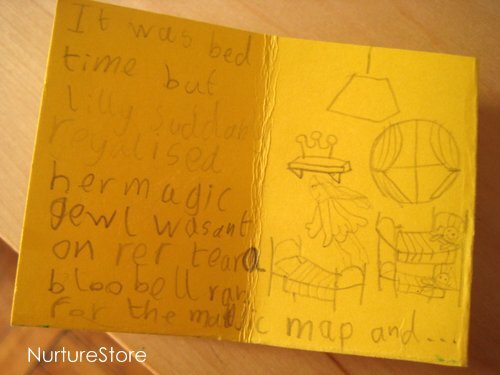 How to write a story :: sticker tales! These stickers tales are lots of fun! 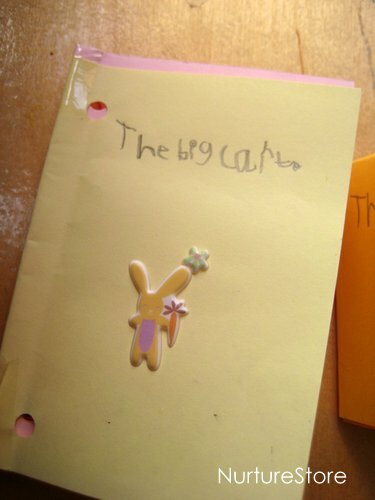 They help children learn how to write a story and can give a great spark to their imaginations. I find they are especially good for reluctant writers and kids who love to draw. 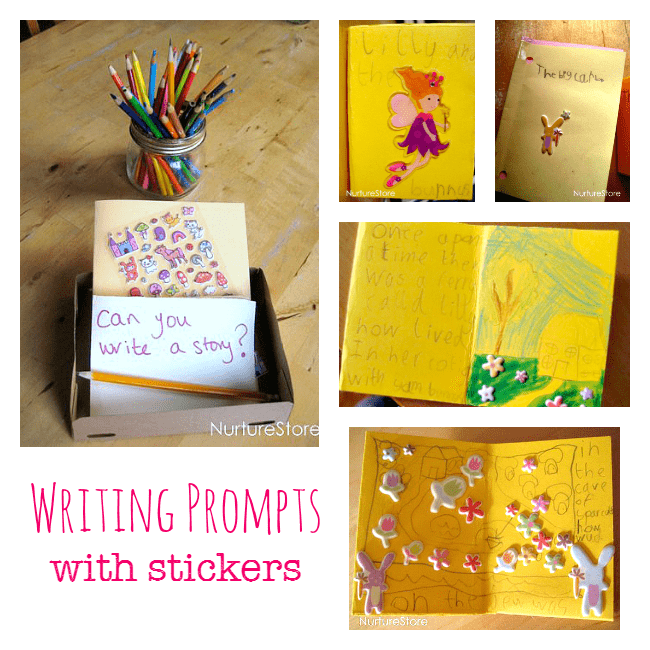 Here’s how we use stickers to write a story and make our very own books. A sticker tale set is easy to put together. 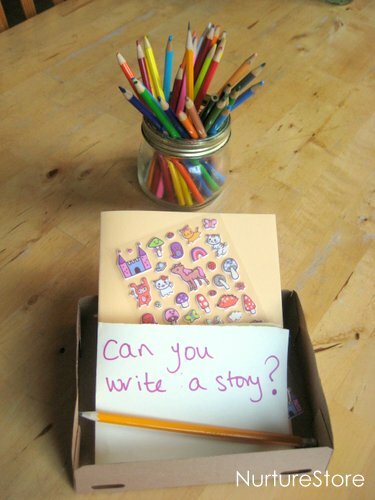 I use a box from our junk modelling supplies and fill it with: paper and card folded into simple little books, a set of stickers and a pot of pencils for writing and drawing. In our house, the addition of stickers makes invitation to write a story irresistible! The little books are easy to make too. We often use zig zag books or French folds to make ours, or try this easy DIY book from Imagination Soup. Keeping the books small seems to be a another trick to making them a hit. 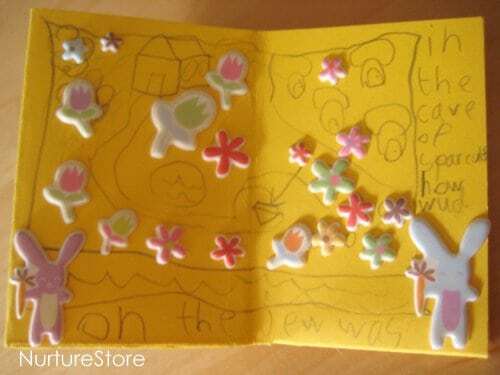 The stickers work as great story prompts, especially if your set features your child’s favourite things, and peeling them is in itself great practice for fine motor skills. With little books, no-one feels daunted by a whole blank page to fill, and encouraging lots of drawing with just a few sentences means they can enjoy the whole process, rather than have it feel like hard work. a beginning to set the scene…..
a middle, containing a problem or a challenge…. and an end to round off the tale. We keep our stories in a special section of our bookshelf dedicated to home made books, and we read them aloud to each other just as we do other books from our library. The children especially love it when someone else picks one of their stories to read, and I think that gives them a lot of extra encouragement to try writing more. Thank you so much for the link, Cathy! I’m honored! And I love to have new visitors come to my blog to chat writing. There is definitely magic in a tiny book. Maybe I’ll see if my 11-year-old wants to make one today. 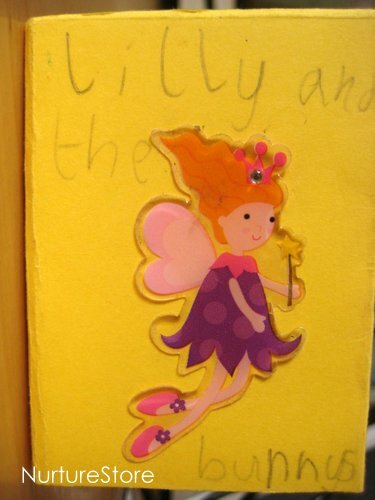 My daughter was always quite a book-maker, but my youngest and I haven’t made them in a while. Oh, it’s my pleasure patricia. I know they’re going to love your site! Such a great idea. I need to get some stickers in themes my little man will love… A search is on. Hope you find some cool stickers Dawn! I love the project and I love the book that resulted! How great that you regularly read from the homemade shelf. 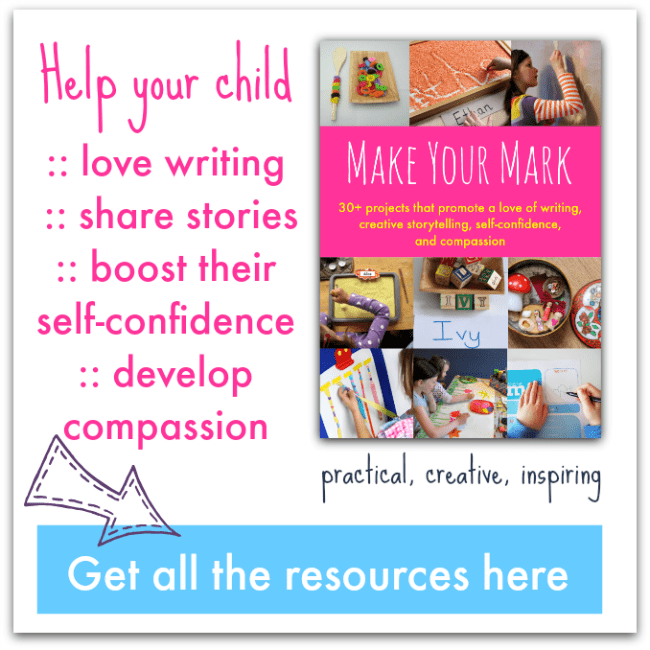 You are bringing up readers and writers who are truly CREATIVE. Can’t tell you how much I admire that. Thank you Susan! Aren’t their books great?! And yes, reading from the homemade shelf really gives the message that we love and enjoy their stories. Stickers are a lovely way to generate ideas. We once made books that had the kids featuring in their own stories… they wove a story, then I clicked them, printed out their pictures and stuck them with backgrounds of ‘jungles’ with dinosaurs and hippos.. was great fun. I love that idea obsessivemom. My 6-year-old would love to star in her own jungle adventure. Thanks for the idea! 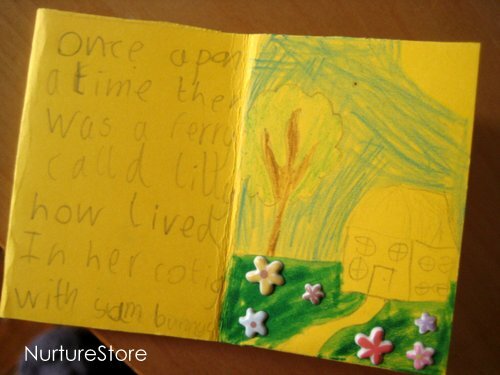 I think this would be such a great idea to get my 6 year old son writing more stories! Where do you suggest for getting stickers? I am in the UK also. Hi Monique. We love to get ours from Paperchase as they have a huge selection.